I spend most of my time in my kitchen these days. Good thing I just love our kitchen. I work on my laptop in a comfy wing chair. When we moved here, the original kitchen was in the basement. I am told basement kitchens are called "summer kitchens." Our house was renovated in the late 1940's by an architect and he added the ell off the original 1751 house. Not sure about his reasonings for a kitchen in the basement but he and his family only lived here during the summers and perhaps it was cooler. When we moved here we converted 3 rooms on the first floor ell into our present day kitchen. It was a mess of a lot of work and money but I am so glad we did it then. I turned the old kitchen into my studio and worked there. I still use that space but because I changed my computer from a standard desktop to a laptop, my work tends to travel around the house. Having the kitchen upstairs makes this house so much more livable. The kitchen is full of lots of my colorful pottery and antique china. It is the nerve center of our house - like most homes. 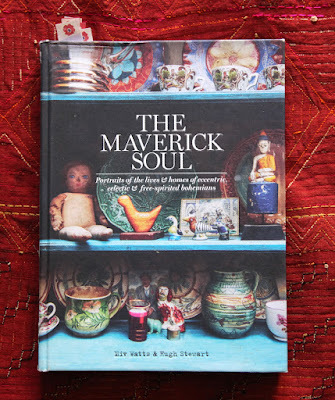 The kitchen table is usually covered with stuff - magazines, The Farmer's iPad, old cups of coffee, a vase of flowers and usually a cat or two is sleeping on a chair. The light pours in nicely and I take many photos on the kitchen table - especially the food shots I have been taking lately. The photo above shows you one of my favorite spots in the kitchen. It is the little window beside the stove and next to the trash can. Do you see the different colored glass in the windows? All of the old windows in the house have tinted glass in shades of lavender, green, and clear with bubbles and lines through them. Love that! The windows are not efficient but I will have a hard time replacing them. Our friend Bob and I built the shelves one weekend and I store all my tea on the little shelves. If you look closely, I have added a Sunflower Garland above one of the shelves made out of the upcoming Sunflower and Zinnia Pattern. This shot was tricky to get with all the backlight pouring in. I've been working hard on trying to master my camera and figure out how to actually get a photo like this to work. I've been enjoying the Photography Section on The Pioneer Woman's website. There are all kinds of fun tips and trick. Check it out here. Our kitchen will be having quite a work-out this week beginning today. Mom arrives for Thanksgiving tonight. The turkeys have been purchased and the cooking will begin and pies will be baked. Mom makes a gorgeous pie. I can't wait - Thanksgiving is probably my favorite holiday because it is all about the food and friendship and there is no gift pressure. I love sharing our house with our family and friends, whether it is a small dinner or big over the top holiday shindig. 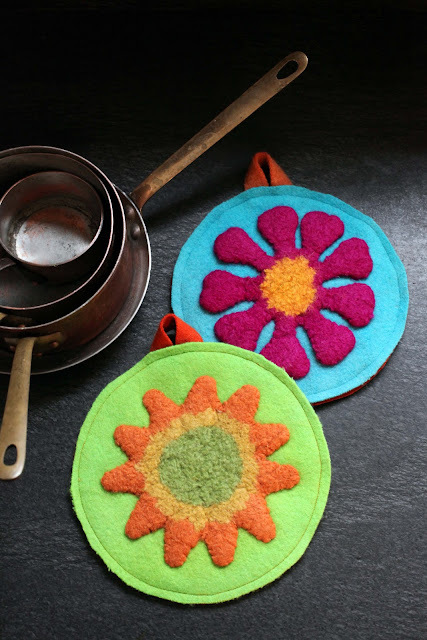 Like I wrote about yesterday, I use handmade wool potholders exclusively. And now I have two new ones shown above! I made them out of two of the Felted Sunflower and Zinnias. I am including the instructions on how to make the potholders in the pattern that launches on Friday. Here's another view. Which photo do you like best? The hanging potholders or the potholders on the black background? Cute potholders! I like the hanging picture best. Happy Thanksgiving! Hanging! 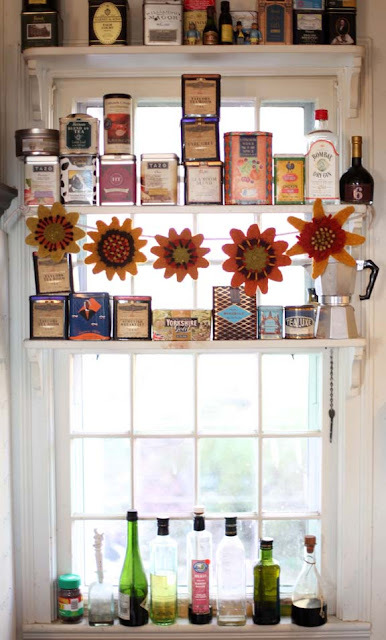 Love your tea window. The combination of all your photos today did the trick: I'll be purchasing your sunflower/zinnia pattern when it's ready! Your house is so charming. I especially love all the tea tins on the shelves. I think I prefer the potholders against the black background. The colors "pop" more. They are so cheerful. While felting is not a favorite project of mine, I would make these. So bright and pretty. I vote for the hanging potholders. Love the glint of copper in front of them! Happy Thanksgiving, Kristin.....I agree, it is the best holiday. When we built our retirement house here in rural NH, we planned it to be open and easy for family and friends, and we are looking forward to dinner for 12 this year. 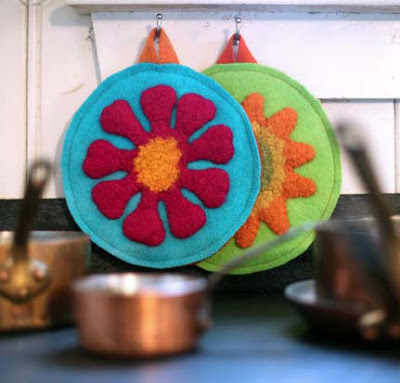 I like the hanging potholders with the copper in the background. Hanging for sure! So colorful and cute. Waiting for that pattern! I've never used wool potholders but am always looking for good ones and can't seem to find any that are quite what I want: both thick and flexible. I like the potholders against the black background best. You can see hte details and colors better. They are very cute. The light in both pictures is gorgeous, but for style, I prefer the hanging. The hanging photo is way more cheerful and upbeat. They do show up on the black background but look kind of lifeless. Odd, isn't it? you can see the potholder detail better in the black background photo, but i prefer the aesthetics of the hanging photo better. that's the one that would make me want the pattern. love the window with the shelves. I like the hanging best because they highlight your copper pots. Do you collect tea tins? Did you have to caulk around your windows to keep the cold out. Can you wear a cat around your neck to keep warm?!!! I just love being invited into your kitchen! 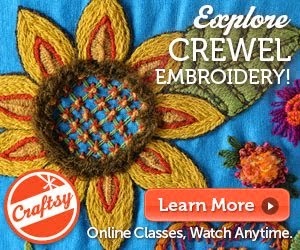 By hook or by crook, I am going to make it to one of your weekend workshops in 2012! The potholders are adorable. I prefer the photo of them hanging for context, but the one of them laying flat gives me a clearer idea of their construction. Does that make sense? Eagerly await the pattern release. I like the black background and I love wool potholders, too. They are the best. I am looking forward to purchasing your new pattern! Adorable patterns. I wish I were so creative. I think they look best against the black background because the color really pops. Happy Thanksgiving!